People lead lives as events unfold and history is made. All of us have interesting personal experiences to relate as we journey through life. We also hear and gather stories from our parents, grandparents and other relatives. Pastconnect.net offers a platform for publishing, sharing and preserving these personal histories. 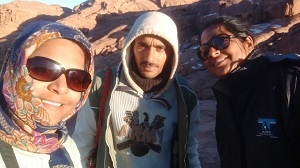 It is unusual for Indians, especially two Indian women, to go backpacking to the Sinai. 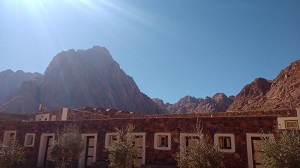 Most Indians who do visit Sinai for the Holy Land tour, do so in large groups. So, when my sister and I travelled there we were met with surprise almost everywhere we went. We hadn’t planned the Sinai trip until the last minute; we were enjoying our Nile cruise from Aswan to Luxor and wondering how to get to Sinai and where to stay once we got there. There was precious little information available on the internet. However, after considerable research I found the Sheik Mousa Bedouin Camp which looked promising and inexpensive. We called the number listed on their website and asked the man, who we later came to know as Saleh, if we could be picked up from Sharm el Sheikh. We were to finish our cruise at Luxor, take a bus from Luxor to Hurghada, hop on a flight from Hurghada to Sharm el Sheikh and then head to Saint Catherine which would be our final destination. Hurghada is a typical resort town along the Red Sea coast with pretty beaches and numerous options for snorkeling and diving enthusiasts. We spent a night in Hurghada at a cheap hotel called the Golden Rose. It had big, clean, functional rooms and gave access to the public beach to all its guests- essentially it was completely worth the price we paid since we were only passing through Hurghada and not planning on spending much time there. The flight from Hurghada to Sharm el Sheikh across the Red Sea is the shortest one I’ve been on in my life so far- 20 minutes end to end! We were picked up at Sharm el Sheikh airport by Mohamed – a member of the Jebeliya Bedouin tribe that lives in Saint Catherine. 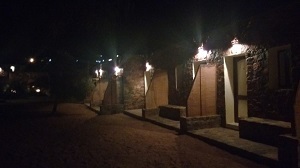 The Sheik Mousa Bedouin Camp is the outcome of collaborative efforts of members of the Jebeliya community to ensure all of the tribe are suitably employed. The Bedouins are a fascinating people. 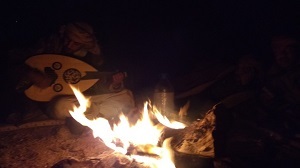 If you’ve never sat around a bonfire out in the cold desert bathed in magical moonlight listening to Bedouin folk stories, you’ve missed something in life! That’s what we did on our first night in Saint Catherine. Saleh and two of his tribesmen, Yasser and Said, took us quite deep into the desert in the dead of night to gaze at the stars. The sky was crystal clear with the bright moon hanging over us like a chandelier. Being a city girl, I’d never seen so many constellations and planets so clearly ever before! The temperature was sub-zero, and I wrapped myself in two heavy blankets to keep the cold out. Said, a musician, had brought his Oud along and he entertained us with soulful renditions of Arab folk songs of love and loss. 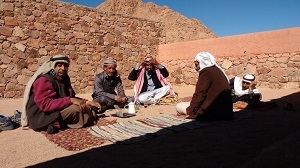 The Bedouins are philosophical people and Saleh regaled us with stories of their tribe’s history and folklore. 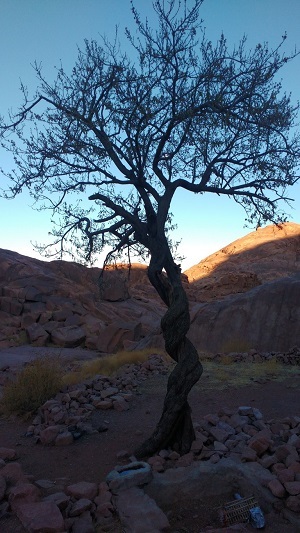 The story of how the Jebeliya tribe made Saint Catherine their home is incredible. 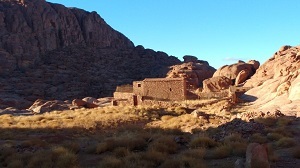 About 1500 years ago forty Bedouin families, who were Christians at the time, were ordered by Emperor Justinian to come to Saint Catherine to protect the monastery. Over the ages, the Jebeliya embraced Islam as their religion but they continue to protect the monastery and view it as a symbol of their history and culture. For the Bedouins, camels are a way of life. They form an integral part of their existence in the harsh conditions of the desert. As a result, most of their folk stories and songs prominently feature camels and when they offer a bride-price to the girl they want to marry, they express it by the number of camels they’re willing to give- the more camels, the more valuable the woman is! Saleh is a uniquely interesting man- one might even call him the Bill Gates of St. Catherine. A very enterprising businessman- he is dedicated to improving the conditions of his tribe, especially its women. He’s surprisingly modern and progressive- he supported the education of two of his sisters and one went on to become a qualified lawyer and the other a teacher. He wants his 17-year-old daughter to become a doctor someday. Through his NGO he enables local Bedouin women to earn some money by making handicrafts. 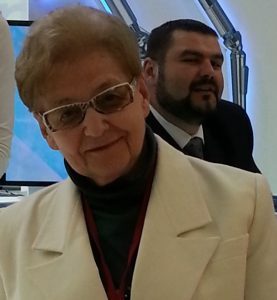 Along with running the Bedouin camp, he owns several other businesses and properties all over Saint Catherine. In spite of being such a busy man, you’ll always find him greeting the guests at the camp, taking the time to show them around and narrating interesting stories. 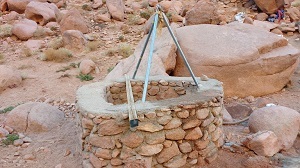 The Bedouins have an independent economy running on a small scale in Saint Catherine. The tribe has appointed leaders- one who represents them and their concerns to the government, one who takes care of economic matters and one who settles disputes. 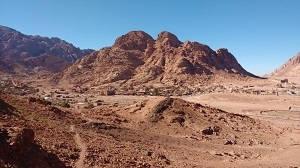 If you stay with the Bedouins, they will take you up to Mount Sinai (locally called Jebel Mousa– the Mountain of Moses) on a path different from the usual tourist route. 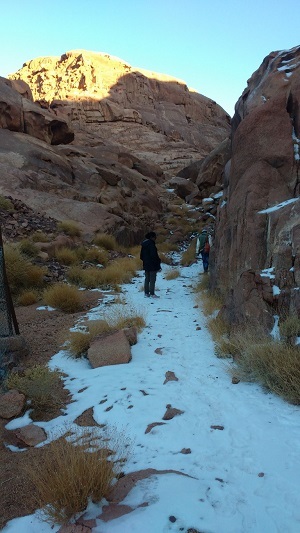 This is the path the local Bedouins use, and you will not meet any other tourists on the way. We had decided to climb Mt. 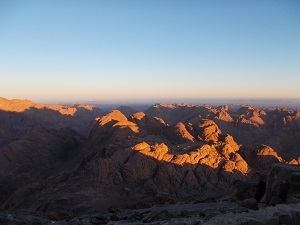 Sinai to watch the sunset rather than the usual sunrise climb. 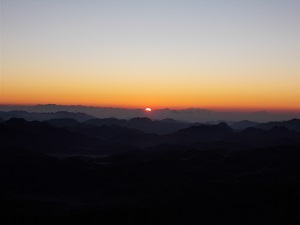 To watch the sunrise, one needs to start climbing at night as it takes about 4 hours to reach the top. We started in the afternoon at 1.30 pm to catch the sunset at 5.30. It was a picturesque route with many beautiful sights to see, including snow! 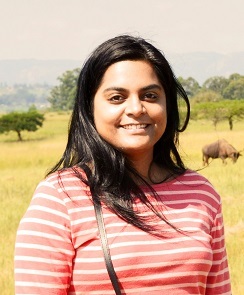 I’m not a seasoned trekker so I found the trek very exhausting; but it was worth all the interesting sights along the way. It is unbelievable how the Bedouins have created a thriving community in these rocky desert mountains in the middle of nowhere with very little vegetation. Yet they have their small gardens and farms of desert plants and they walk miles and miles each day to graze their herds of sheep. The trek up to the top took longer than expected and we reached huffing and puffing a few minutes after sundown. It was freezing by then and we collapsed on the bench as we entered the café at the top of the mountain. 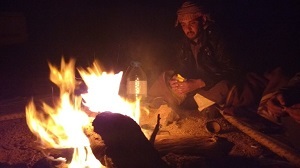 Our Bedouin guide though was as energetic as ever and immediately got down to the job of making us some hot tea. He hadn’t even had a sip of water throughout the trek despite being offered several times and wasn’t out of breath at all! I, for one, let him know that there was no way in hell that I would make my way down that mountain again that night and I needed accommodation for the night. He called Saleh right away and arranged for us to sleep there overnight. As we waited for dinner to get ready, I realized I needed to use the restroom and ventured outside to locate it. I regretted it immediately as I was hit by a blast of icy cold wind and in spite of 3 layers of warm clothes, my insides froze. I tried to finish up and rush back to the relative warmth of the café as soon as possible. Once I was back, Samira, the pet cat decided her perch on my lap and made herself very comfortable there. Samira means ‘sweet company’ in Arabic and sweet she was! This darling cat, who started following us when we were a little more than halfway up the mountain, acted as my inspiration when I thought of giving up on account of exhaustion. She would wait for us to make our way up and then go ahead a few more steps to wait again. Although she’s a pampered little cat, she’s a free spirit that roams the mountains on her own and comes up to the café every two or three days. Once the delicious dinner of roast chicken, rice, vegetables and hot soup was served, Samira stationed herself under my seat and demanded bits of chicken at regular intervals. After dinner we made our way to the room prepared by our guide and the café owner for us to sleep in. They had very kindly made beds for us and provided us with several blankets, and we were given sufficient privacy by screening off a section of the room with curtains. In the morning this room would turn into a café serving hot tea and coffee to the sunrise climbers. Despite using 3 heavy blankets, my feet remained frozen through the night which resulted in a disturbed sleep. We awoke at 4.30 the next morning to watch the sunrise which was supposed to be at 5.15. There were already close to 100 other tourists who’d turned up for the sunrise by the time we woke up. After a highly welcome hot cup of tea, we wrapped ourselves in a blanket and made our way up the last hundred steps to reach the sunrise point. It was still dark and our hands were numb from the bitter cold. As the dawn broke across the sky, we witnessed the glorious sun emerge from the horizon and spread light and warmth over the valleys below. I experienced something close to an epiphany of how Moses must have felt all those thousands of years ago, standing high up on this very mountain looking over the world below and receiving the word of God. After the sunrise we started making our way back down. We were to stay at the camp that night and leave for Cairo by bus early next morning. As our stay there was drawing to a close, I wished we could stay longer and know the people better. Bedouins are some of the most warm and hospitable people who go out of their way to make you feel comfortable and welcome. Of all the travel experiences I’ve had, this one will surely remain in my heart as one of the most memorabl. Saleh was sad to see us go and gave us friendship bracelets as parting gifts, a gesture that really touched us. 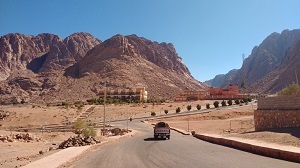 We bid goodbye and boarded our bus which made its way through the stunning, stark landscape of the Sinai desert towards the bustling city of Cairo. Shukti Basu lives in New Delhi.